If you are connected with Internet, then you are no longer safe. I am sorry to say this for that is truth. Starting from the age of eight to eighty, or a normal internet user or the vice president of European Commission no one is safe and secure in front of cyber criminals. The above scenario has been proved once again, when conference on Internet security was taking place in Azerbaijan. According to sources a European official says her staff members were hacked when they joined her for the said conference. 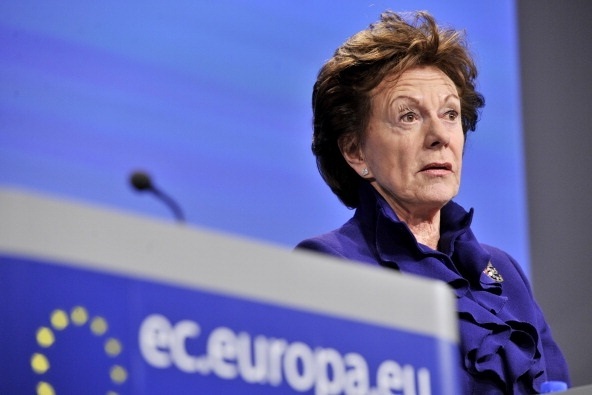 In a blog post the Vice President of European Commission, Neelie Kroes said that her advisers' computers were compromised as they attended a meeting of the Internet Governance Forum in Baku, the Azeri capital. Her spokesman, Ryan Heath, said the attack occurred while they were in their hotel. Heath said he and a colleague got messages from Apple Inc. warning them that their computers had been accessed by an unauthorized party, something he said he believed was an attempt to spy on him. "I'm presuming it was some kind of surveillance," he said in a telephone interview. "What we're going to do is to get the computers forensically analyzed to see what if anything was taken out of them." He declined to say who he thought might be responsible. Kroes was critical of her hosts when speaking before the forum on Wednesday, attacking the Azeri government for allegedly spying on activists through the Internet and "violating the privacy of journalists and their sources." In her blog post Saturday, Kroes cited the hacking as one of several violations which she said highlighted the "harsh" reality of political life in Azerbaijan, an oil-rich nation on the shores of the Caspian Sea. Kroes said that Azeri authorities reneged on a deal to allow her to see political prisoners, and she claimed that activists at the Internet conference were harassed. "So much for openness," she wrote.